My name is Franklin S. Santos, I am a geriatric doctor, and 11 years ago I started working in teaching, research and assistance in the areas of Thanatology and Palliative Care in Brazil. Since then, I have had the opportunity to organise courses and interdisciplinary books that address these issues. These books became a reference for the Brazilian community interested in palliative care. In 2012, I wanted very much to visit St. Christopher’s Hospice in London and decided to take a palliative care course and attend lectures on grief with Prof. Colin Murray Parkes. The extraordinary figure of Cicely Saunders has always attracted me, especially after reading a little more about her biography. Cicely has always been a very spiritual person and her faith has supported and guided her to create this movement that we now call Palliative Care. That spirituality has given me support in my work here in Brazil. This fact has further increased my admiration for her and her relevant work. Unfortunately much of the Brazilian population, even among health professionals, do not have English-language communication skills and much of what Cicely wrote is hidden from all those who have decided to work in this area. In addition to palliative care, to some degree, it is already beginning to detract from Cicely’s original proposal, which consisted of a perfect harmony between technique and humanism, between scientific rationality and the basic questions of spirituality. Of all the books and articles she has written, I think that ‘Watch With Me’ is the masterpiece, I would really say it represents her soul. And so, in translating it, we Brazilians could somehow talk with Cicely, the original source, without other interference and learn – or relearn – how to teach, research and assist in palliative care. In this way, the translation of the book ‘Watch With Me’ becomes a great gift and stimulus of Cicely herself so that Palliative Care can be developed in a creative, technical, loving, correct and spiritual way, also in Brazil. The process of translating this extraordinary book by Cicely Saunders was a challenging but at the same time a stimulating and creative experience. It demanded of me full concentration, readings of Bible texts, and intuition; resulting in many insights. I think my first and biggest concern was the translation responsibility itself. Translating Cicely, and even more her soul and her innermost values, ​​was a task that needed to be thought about with a lot of responsibility. I needed to analyse myself, ask if I was up to task. And after this thought, I accepted that challenge, for she deserved to have her writings published in Brazilian Portuguese and for me to grow as a person interested in palliative care. However, my task was facilitated, in a way, since there was a very well made translation into the Portuguese of Portugal by an expert in English literature and by a palliative physician: Isabel Galriça Neto and her son Francisco Galriça, to whom I am indebted and grateful. As I leaned over the book to translate it, I was simultaneously looking at the original and the Portuguese Version. For although the Portuguese language is the same as that spoken in Brazil and Portugal, there are differences in orthography and even the meaning of many words, added to the interpretation that the Portuguese writers lent in the sentences, and there also a little of their own values, since there is no neutral translation, literal, word for word. Another question that came up as a challenge was to enter into the spiritual values ​​of Cicely Saunders, for most of the biblical passages, the ones I was almost familiar with, could have other readings and meanings for Cicely herself, since she came from a Protestant and Anglican background, while I had a Catholic origin. I read with a very open spirit, really longing to know the depth of thought behind those biblical passages. What were Cicely’s intentions in using them? I soon realised that Cicely did not use them in the specific theological sense, but rather in the context of human suffering, especially within the context of palliative care. She also used it to provide help to her patients and their families, as well as to her own life and to walk in that area. And the last hurdle to be transposed was the publication of the book. 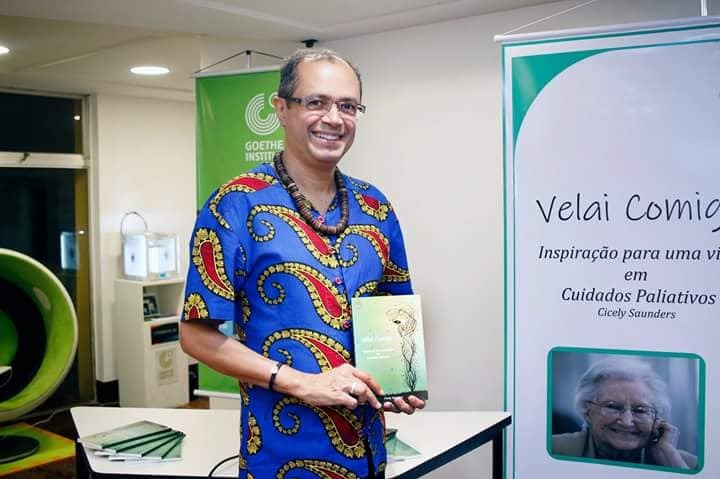 I could have chosen a well-known publisher in the health field to publish, but I accepted the challenge of publishing independently, since in Brazil it is possible for anyone to publish a book without necessarily having the help of a publisher. So I had to do a lot of research on the internet about how this could be done, and I followed step by step what is taught by people who published their books independently. It was very enriching and rewarding to know that I was able to follow the whole process from translation to final production. When I was choosing an image for the book cover, I wanted to put an image that could translate, since a picture is worth a thousand words, through a single image everything inside the book, and I believe I have also succeeded in this question. So I come out of this process of translation, editing and publication deeply transformed, happy, culturally and spiritually enriched, and closer to Cicely. I have not had the opportunity to enjoy her physical presence, but I have with a sense of intimacy and of deep gratitude to her for this opportunity offered to me. And last, but not least, my special thanks to David Clark for his generosity in offering this opportunity, and for all the assistance and encouragement that this translation would come to light and be realised. Meu nome é Franklin, sou médico geriatra, e há 11 anos comecei a trabalhar no ensino, pesquisa e assistência nas áreas de Tanatologia e Cuidados Paliativos no Brasil. Desde então, eu tive a oportunidade de organizar cursos e livros interdisciplinares que abordam essas temáticas. Esses livros se tornaram referência para a comunidade brasileira interessada nos cuidados paliativos. Em 2012, eu desejava muito ir conhecer o St Christopher hospice em Londres e decidi fazer um curso de cuidados paliativos e assistir pequenas palestras sobre luto com o Prof. Colin Parkes. A figura extraordinária de Cicely Saunders sempre me atraiu, especialmente após ler um pouco mais sobre sua biografia. Cicely sempre foi uma pessoa muito espiritualizada e a sua fé a sustentou e a guiou para criar esse movimento que hoje denominamos de cuidados paliativos. E igualmente a espiritualidade é que me dar sustentação no meu trabalho aqui no Brasil. Esse fato aumentou mais ainda minha admiração por ela e seu relevante trabalho. Infelizmente, grande parte da população brasileira, mesmo entre os profissionais de saúde, não possui habilidades de comunicação da língua inglesa e muito do que Cicely escreveu encontra-se oculto para todos aqueles que decidiram trabalhar nessa área, ademais os cuidados paliativos, em certo grau, na minha perspectiva, já começa a se desvirtuar da proposta original de Cicely que consistia em uma perfeita harmonia entre a técnica e o humanismo, entre a racionalidade científica e as questões basilares da espiritualidade. Dentre todos os livros e artigos que ela escreveu, penso que, Velai Comigo seja a coluna mestra, diria mesmo a sua alma e assim, ao traduzí-lo , nós brasileiros, poderíamos de certa forma dialogar com o pensamento de Cicely, beber diretamente na fonte, sem interferências outras e aprendermos, ou reaprendermos como ensinar, pesquisar e assistir em cuidados paliativos. 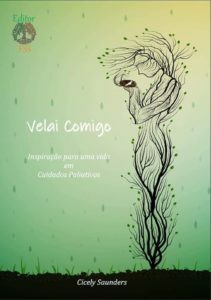 Dessa forma, a tradução do livro Velai Comigo torna-se um grande presente e estímulo da própria Cicely para que os Cuidados Paliativos possam se desenvolver de forma criativa, técnica , amorosa, correta e espiritualizada , também, no Brasil. O processo de traduzir este livro extraordinário de Cicely Saunders foi uma experiência desafiadora, mas ao mesmo tempo estimulante e criativa. Exigia de mim plena concentração, leituras de textos bíblicos, intuição, resultando em muitos insights. Acho que minha primeira e maior preocupação foi a responsabilidade da tradução em si. Traduzindo Cicely e ainda mais sua alma, seus valores mais íntimos era uma tarefa que precisava ser pensada com muita responsabilidade, eu precisava me analisar, se estava à altura da tarefa. E depois disso aceitei aquele desafio, porque Cicely merecia ter seus escritos publicados em português brasileiro e para mim como um crescimento como pessoa e interessado em cuidados paliativos. Contudo, a minha tarefa foi facilitada de certa forma, uma vez que houve uma tradução muito bem feita para o português de Portugal por um especialista em literatura inglesa e por uma médica paliativivista: Isabel Galriça Neto e o seu filho Francisco Galriça, a quem agradeço e sou muito grato. Ao me debruçar sobre o livro para traduzi-lo, estava olhando simultaneamente para o original e para a versão em português. Pois, embora a língua portuguesa seja a mesma falada no Brasil e em Portugal, há diferenças de ortografia e até de sentido em muitas palavras, somadas à interpretação que os escritores portugueses emprestam nas sentenças, e também há um pouco de seus próprios valores. , uma vez que não há tradução neutra, literal, palavra por palavra, assim igualmente ficou a minha tradução, pois um pouco de mim ali também está. Outra questão que surgiu como desafio foi entrar nos valores espirituais de Cicely Saunders, pois a maioria das passagens bíblicas, com as quais eu estava familiarizado, poderia ter outras leituras e significados para a própria Cicely, já que ela veio de um background protestante. e especificamente anglicana, enquanto eu tinha uma origem católica e depois vivi muitos anos como espírita. Li com um espírito muito aberto, desejoso de conhecer a profundidade de pensamento por trás dessas passagens bíblicas, quais eram as intenções de Cicely em usá-las, porque logo percebi que Cicely não as usava no sentido teológico específico, mas sim no contexto do sofrimento humano, especialmente no contexto dos cuidados paliativos. Ela também as usava para ajudar seus pacientes e suas famílias, bem como à sua própria vida e o seu caminho naquela área. E o último obstáculo a ser transposto foi a publicação do livro. Eu poderia ter escolhido uma editora conhecida na área da saúde para publicar, mas aceitei o desafio de publicar de forma independente, já que no Brasil é possível que qualquer um publique um livro sem necessariamente ter a ajuda de um editor. Então eu tive que fazer muita pesquisa na internet como isso poderia ser feito. E eu segui passo a passo o que é ensinado por pessoas que publicaram seus livros independentemente. E foi muito enriquecedor e recompensador saber que consegui acompanhar todo o processo desde a tradução até a produção final. Quando eu estava escolhendo uma imagem para a capa do livro, eu queria colocar uma imagem que pudesse traduzir, já que uma imagem vale mais que mil palavras, através de uma única imagem tudo dentro do livro, e acredito que também obtive sucesso nesta questão. Então, eu saio desse processo de tradução, edição e publicação, profundamente transformado, feliz, enriquecido culturalmente e espiritualmente, e mais próximo de Cicely, ainda que não tenha tido a oportunidade de ter gozado da sua presença física, mas com um sentimento, agora, de intimidade e de profundo gratidão a ela por esta oportunidade a mim oferecida. E por último, mas não o último, o meu especial agradecimento ao David Clark pela sua generosidade em oferecer essa possibilidade, por toda assistência e estímulo para que essa tradução viesse à luz e corporificasse. President of the Brazilian Association of Tanatology and member of the technical chamber of Palliative Care of CREMEB. He has experience in Medicine, with emphasis in Thanatology and Palliative Care.